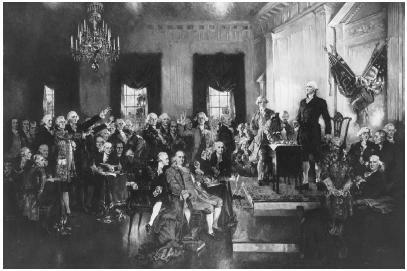 A depiction of George Washington presiding over the signing of the U.S. Constitution in Philadelphia on September 17, 1787. A written document executed by representatives of the people of the United States as the absolute rule of action and decision for all branches and officers of the government, and with which all subsequent laws and ordinances must be in accordance unless it has been changed by a constitutional amendment by the authority that created it. For over 200 years, the Constitution of the United States has served as the foundation for U.S. government. Created in 1787, the U.S. Constitution establishes and defines the basic outlines of a national government that joins the states in an effective political union. The U.S. Constitution has been and remains one of the most enduring political agreements in the history of the world. Throughout its existence, it has served as an inspiring example of the potential of constitutional government, causing many other countries and peoples to emulate its provisions. According to Article VI of the Constitution, the U.S. Constitution is "the supreme Law of the Land." All other laws and judicial decisions are subject to its mandates. The Constitution therefore has higher authority than all other laws in the nation, including statutes and laws passed by Congress and state legislatures. Unlike those other laws, the Constitution may be changed, or amended, only in special ways that reflect its character as a demonstration of the people's will. The original document of the U.S. Constitution is held at the National Archives, in Washington, D.C. The Constitutional Convention of 1787 is a high point in the history of the United States. This remarkable assemblage of men, meeting in Philadelphia between May 23 and September 17, 1787, created the document that has given the United States one of the most stable and admired constitutional democracies in the history of the world. 55 delegates from 12 states attended various parts of the convention. Drawn from the educated and wealthy elite of the country, they included such luminaries as George Washington, the commander of American forces in the War of Independence, who presided over the convention, and Benjamin Franklin, at 81, the oldest delegate and the country's most famous statesman. A majority of the delegates were lawyers, and many, such as James Madison, were wealthy landowners. Many notable leaders of the time, however, including Thomas Jefferson, who was in France, and Patrick Henry, did not attend. The meetings of the convention were closed to the public and to the press. Thus, behind closed doors, the delegates hammered out the eventual form of U.S. government. The agreements reached during the convention exemplified the values of constitutional government. In an atmosphere that combined competitive, lively debate with tolerance and respect for differences of opinion, the delegates reached vital compromises on matters that threatened to divide the still loosely connected union of states. Many different factions opposed one another—small states versus large states, farmers versus businesspeople, North versus South, and slave states versus nonslave states. The Constitutional Convention occurred in three separate phases. The first, from May 23 to July 26, created the basic features of the national government, including its division into legislative, executive, and judicial branches. During this phase, delegates also arrived at one important compromise between the interests of large and small states. That compromise created a bicameral, or two-chamber, legislature, composed of the House of Representatives and the Senate. During the second phase of the convention, from July 27 to August 6, the five-man Committee of Detail created a rough draft of the Constitution. In the third phase, which lasted from August 6 to September 6, the delegates debated remaining sticking points, particularly relating to the Executive Branch and the means of electing a president. Eventually, they settled on the Electoral College suggested by Benjamin Franklin. On September 17, 39 of the 42 delegates present signed the Constitution. Gouverneur Morris, coauthor of the New York State Constitution and a key delegate, summed up the significance of the Constitution that the convention had created when, after affixing his signature to it, he uttered these words: "The moment this plan goes forth, all other considerations will be laid aside and the great question will be: Shall there be a national government or not? And this must take place or a general anarchy will be the alternative." Rossiter, Clinton. 1966. 1787: The Grand Convention. Reprint, New York: Norton, 1987. Scott, James Brown. 2001. James Madison's Notes of Debates in the Federal Convention of 1787 and their Relation to a More Perfect Society of Nations. Union, N.J.: Lawbook Exchange. When the United States declared itself a country separate from Great Britain in 1776, it did not have a written constitution. Instead, the 13 former colonies each had their own sovereignty and separate bodies of law. How the newly formed United States would act as one nation remained uncertain and undefined. The Continental Congress, the first national legislative body of the new nation, attempted to address this state of affairs by drafting the nation's first constitution, the Articles of Confederation, which were ratified in 1781, the same year that hostilities in the Revolutionary War against Britain came to an end at Yorktown, Virginia. The Articles of Confederation proved an ineffective national constitution. That document did not provide for a strong federal, or central, government and allowed each state its own "sovereignty, freedom and independence" (art. II). It also did not provide the federal government power to tax or regulate commerce. I am mortified beyond expression when I view the clouds that have spread over the brightest morn that ever dawned upon any country. You talk of employing influence to appease the present tumults in Massachusetts. Influence is no government. Let us have a government by which our lives, liberties and properties will be secured; or let us know the worst at once. Seeking to address the inadequacies of the Articles of Confederation, the Continental Congress called for the Constitutional Convention to create a better basis for union between the states. The convention began in Philadelphia on May 25, 1787, with the original intention of amending the Articles of Confederation. However, the delegates—including benjamin franklin, alexander hamilton, james madison, and George Washington—soon planned an entirely new constitution. Fifty-five delegates representing 12 states (all but Rhode Island) discussed different plans for a federal government. They agreed to create a government consisting of three separate branches—executive, legislative, and judicial—with checks and balances to keep any one branch from becoming too powerful. However, they dis-agreed strongly over particulars. For example, two plans for representation in a national legislature competed for the loyalty of delegates. The so-called Virginia Plan, presented by edmund randolph and designed by James Madison, called for a bicameral, or two-house, legislature. Representation in the lower house would be proportional to population, and representation in the upper house would be elected by the lower house. Delegates from small states felt that such a plan would give too much power to large states. They favored the New Jersey Plan, which called for a unicameral legislature with equal representation to each state. Delegates settled the issue by voting for a compromise plan—called the Great Compromise, or the Connecticut Compromise—which established a Senate that gave each state two representatives and a House of Representatives that granted each state a number of representatives proportional to its population. On September 17, 1787, 39 delegates signed the completed Constitution. In subsequent months, the document went before each of the states for ratification. The ratification process was accompanied by a spirited debate on the merits of the Constitution. The Federalists, on one side of the debate, supported ratification. Federalist leaders Alexander Hamilton, John Jay, and James Madison argued eloquently on behalf of the Constitution in a series of newspaper essays that were published as The Federalist papers. Those opposed to the Constitution were called Anti-Federalists. The ratification process, as contained in Article VII of the Constitution, required that nine of the 13 states approve the Constitution in special conventions. Within ten months after the Constitution was completed, ten states had ratified it. Rhode Island was the last of the 13 states to ratify the Constitution, on May 29, 1790, officially making the Constitution the highest law of the land. We the People of the United States, in Order to form a more perfect Union, establish Justice, insure domestic Tranquility, provide for the common defence, promote the general Welfare, and secure the Blessings of Liberty to ourselves and our Posterity, do ordain and establish this Constitution for the United States of America. The Preamble is not strictly considered a part of the Constitution and is not legally binding on issues relating to either government power or private right (Jacobson v. Massachusetts, 197 U.S. 11, 25 S. Ct. 358, 49 L. Ed. 643 ). Article I Article I of the Constitution deals with the legislative branch of government. It establishes the bicameral Congress, consisting of a Senate and a House of Representatives, and it delineates the means by which Congressional members shall be elected, the length of their terms, and the requirements for membership, including age. It also sets forth guidelines for legislative procedure, including a requirement that bills of revenue, or taxation, must originate in the House; requirements for the process by which bills pass from Congress to the president; and the procedures in case of presidential Veto, or refusal to sign a bill into law. Article I, Section 2, prescribes for the means of Apportionment, or the method by which representatives are allocated to the states. Because political power would inevitably flow to the states with the most congressional representatives, this topic was controversial at the time of the framing of the Constitution. Whereas each state receives two votes in the Senate, the number of representatives each state receives in the House is determined by an enumeration, or census, to be conducted every ten years. According to this same section, a state's population is to "be determined by adding to the whole Number of free Persons, including those bound to Service for a Term of Years, and excluding Indians not taxed, three fifths of all other Persons." Thus, an indentured servant was counted as a whole person, and an African American slave was counted as only three-fifths of a person. This last provision arose out of differences between slave and nonslave states. Counting slaves as equal persons would have given southern states a greater number of representatives and more power in Congress. Northern states vigorously opposed such a scheme, and the resulting compromise was called the Three-fifths Compromise. Article I, Section 8, gives Congress some of its delegated powers, many of them crucial powers that had been denied to the Congress of the Confederation. These include the powers to "lay and collect Taxes," "borrow Money," "coin Money," "establish Post Offices," "declare War," "raise and support Armies," "provide and maintain a Navy," and "make all Laws which shall be necessary and proper for carrying into Execution" all the other powers. This last clause is called the Necessary and Proper Clause and has been used to justify later expansion of congressional activity not specifically mentioned in the Constitution. The clause has also been called the elastic clause or implied powers clause. Article I, Section 8, also gives Congress the power to "regulate Commerce with foreign nations, and among the several States, and with the Indian Tribes." This is called the Commerce Clause. And Article I, Section 8, gives Congress power over a district to "become the Seat of the Government of the United States," later established as the District of Columbia, or Washington, D.C. Article I, Section 9, limits congressional powers, forbidding the passage of laws prohibiting the "Migration or Importation" of persons before the year 1808. This provision was designed as a concession to slaveholding states, ensuring that the practice of Slavery would not be challenged for at least 20 years. Section 9 also prohibits Congress from passing any ex post facto, or retroactive, laws, and from granting any "Title of Nobility." Article I, Section 10, limits the powers of the states, prohibiting, for example, the states to enter into foreign treaties and coin money. Article II Article II concerns the Executive Branch, or the presidency. Section 1 establishes the Electoral College as the means of electing the president, identifies the requirements for holding presidential office, and outlines the procedure in case a president is removed from office or dies. It also contains the oath that the president must take before entering the office, which explicitly requires that the president support the Constitution: "I do solemnly swear (or affirm) that I will faithfully execute the Office of President of the United States, and will to the best of my Ability, preserve, protect and defend the Constitution of the United States." Article II, Section 2, names the president as commander in chief of the armed forces. It also gives the president the power to grant pardons or reprieves; make treaties with foreign powers, subject to approval by the Senate; and appoint ambassadors and Supreme Court justices. Article II, Section 4, allows for removal and Impeachment of the president and "all civil Officers of the United States" in cases of conviction for "Treason, Bribery, or other High Crimes and Misdemeanors." Article III Article III establishes the Supreme Court of the United States as the highest judicial power. Section 2 defines the jurisdiction of the federal judiciary. Section 3 defines and limits prosecution for Treason. The power of Judicial Review, whereby the Supreme Court may declare laws and regulations of government to be unconstitutional, is not explicitly declared in the Constitution and was not established by the Supreme Court until the case of marbury v. madison, 5 U.S. (1 Cranch) 137, 2 L. Ed. 60 (1803).Article IV Article IV defines the relations between the states. It requires each state to give "full Faith and Credit" to the laws of the other states; establishes that citizens are entitled to the same "Privileges and Immunities," or liberties and rights, as citizens in every other state; provides for Extradition between states of persons charged with crimes; provides for and limits the admission of new states; gives Congress full power over U.S. territories that are not yet states; and guarantees each state "a Republican Form of Government" and protection against invasion or "domestic Violence." Article V Article V sets forth a two-step procedure for amending the Constitution: proposal of amendments, followed by ratification. Amendments may be proposed in two ways: by a two-thirds vote of both houses of Congress or by a special convention called by two-thirds of the state legislatures. Amendments are ratified by one of two methods, determined by Congress: approval of three-fourths of the state legislatures or approval of three-fourths of special state conventions. Article VI Article VI declares the Constitution and the laws and treaties made by the U.S. government under its authority to be "the supreme Law of the Land." This provision is called the Supremacy Clause. Article VI also requires that all judges in every state be subject to the provisions of the Constitution, that all state and federal officeholders swear an oath supporting the Constitution, and that "no religious Test shall ever be required as a Qualification to any Office" of the United States. Amendments The Constitution has been amended 26 times. The first ten amendments were ratified in 1791 and are called the Bill of Rights. The Constitution defined a number of the fundamental and enduring principles of U.S. government, particularly the concepts of Separation of Powers, checks and balances, and Federalism. Separation of powers refers to the division of power between the legislative, executive, and judicial branches of government. Checks and balances refers to a system whereby each branch of government retains some of the powers of the other branches, which it may use to control other branches. Thus, the president may veto bills passed by Congress, the Senate may vote down presidential appointments, and the Supreme Court may strike down laws approved by Congress or regulations put forth by the executive. Such actions keep the separate branches of government in balance and prevent any one of them from becoming too powerful. In framing a government, … the great difficulty lies in this: You must first enable the government to control the governed; and in the next place, oblige it to control itself. A dependence on the people is, no doubt, the primary control on the government; but experience has taught the necessity of auxiliary precautions. The Constitution, with its separation of powers and checks and balances, provided just such "auxiliary precautions" to be used in controlling government. The Constitution is also guided by the concept of federalism in the way that it constructs the U.S. government. Federalism is a system in which smaller political entities—such as states, counties, cities, and localities—are united in a larger political organization. Federalism intends to protect the liberties of people in these smaller political units by providing them with a great degree of freedom in governing themselves. The federal, or larger, government is then a limited government that cedes many decision-making responsibilities—including, for example, the creation of most criminal and civil laws, municipal codes, regulations for administering school districts, and the like—to states and localities, while leaving itself other responsibilities. In short, federalism is a partnership in which a central government shares authority and power with regional or local governments. The U.S. Constitution gives the federal government—made up of the executive, legislative, and judicial branches—power to make decisions regarding such issues as war, national defense, and trade with foreign countries. The federal government also retains the right to overrule laws or decisions of lower units of government when they are in violation of the Constitution. Thus, for example, the federal government took on responsibilities in the over-sight of local school districts after the Supreme Court, in brown v. board of education, 347 U.S. 483, 74 S. Ct. 686, 98 L. Ed. 873 (1954), ruled that segregating children in different public schools by race violated the equal protection clause of the Fourteenth Amendment to the Constitution, which says, "No State shall … deny to any person … the equal protection of the laws." Black, Eric. 1988. Our Constitution: The Myth That Binds Us. Boulder, Colo.: Westview Press. Browne, Ray B., and Glenn J. Browne. 1986. Laws of Our Fathers: Popular Culture and the U.S. Constitution. Bowling Green, OH: Bowling Green Univ. Press. Corwin, Edward S. 1978. The Constitution and What It Means Today. 14th ed. Rev. Harold W. Chase and Craig R. Ducat. Princeton, N.J.: Princeton Univ. Press. Hamilton, Alexander, James Madison, and John Jay. 1787– 88. The Federalist Papers. Ed. Clinton Rossiter. Reprint, New York: New American Library of World Literature, 1961. Marshall, Burke, ed. 1987. A Workable Government? : The Constitution after 200 Years. New York: Norton. Maxwell, James A., ed. 1982. You and Your Rights. Pleasantville, N.Y.: Reader's Digest. McGuire, Robert A. 2003. To Form a More Perfect Union: A New Economic Interpretation of the United States Constitution. Oxford, New York: Oxford Univ. Press. Rawle, William. 2003. A View of the Constitution of the United States of America. 2d ed. Clark, N.J.: Lawbook Exchange. Story, Joseph. 2001. Constitution of the United States: With a Preliminary Review of the Constitutional History of the Colonies and States, Before the Adoption of the Constitution Union, N.J.: Lawbook Exchange. Congress of the United States; "Constitution of the United States" (Appendix, Primary Document); Constitutional Amendment; Constitutional Law; Federalist Papers; Full Faith and Credit Clause; Presidential Powers. The U.S. Constitution was drafted in 1787 in Philadelphia by delegates to the constitutional convention. The delegates decided soon after their arrival that the Articles of Confederation could not be saved through amendment and that an entirely new constitution should be written to replace it. The document that emerged from the convention was the product of a series of compromises. Once the Constitution had been offered to the states for ratification, critics opposed it on several grounds. Most importantly, they argued that the Constitution created an overly powerful central government that could abuse the rights of citizens and criticized the Framers for failing to include a bill of rights. To win over the opposition, the supporters of the Constitution agreed that the enactment of a bill of rights should be among the business of the first Congress. By June 21, 1788, the requisite nine states had ratified the Constitution. Virginia and New York ratified it a few days later, while North Carolina did so in 1789 and Rhode Island agreed to the Constitution in 1790. Since the Constitution went into effect in 1789, only twenty-seven amendments have been added to correct deficiencies in the original document or to adapt it to changing needs and principles. Representatives and direct Taxes shall be apportioned among the several States which may be included within this Union, according to their respective Numbers, which shall be determined by adding to the whole Number of free Persons, including those bound to Service for a Term of Years, and excluding Indians not taxed, three fifths of all other Persons.1 The actual Enumeration shall be made within three Years after the first Meeting of the Congress of the United States, and within every subsequent Term of ten Years, in such Manner as they shall by Law direct. The Number of Representatives shall not exceed one for every thirty Thousand, but each State shall have at Least one Representative; and until such enumerations shall be made, the State of New Hampshire shall be entitled to chuse three, Massachusetts eight, Rhode-Island and Providence Plantations one, Connecticut five, New-York six, New Jersey four, Pennsylvania eight, Delaware one, Maryland six, Virginia ten, North Carolina five, South Carolina five, and Georgia three. Section 3. The Senate of the United States shall be composed of two Senators from each State, chosen by the Legislature thereof,2 for six Years; and each Senator shall have one Vote. The Congress shall assemble at least once in every Year, and such Meeting shall be on the first Monday in December,4 unless they shall by Law appoint a different Day. 1 Provisions that have been changed by amendments or other legislation or have become obsolete have been printed in italic type. The Sixteenth Amendment overturned the provision on direct taxes. The provision on apportionment was overturned by the Thirteenth Amendment, which abolished slavery, and by the Fourteenth Amendment, which stipulated that all persons excluding Indians should be counted. Since 1940 Indians have also been counted. 2 Changed by the Seventeenth Amendment. 3 Modified by the Seventeenth Amendment. 4 Changed by the Twentieth Amendment, Section 2, to January 3. 5 Formal treaty arrangements with the Indians were abandoned after 1871. 6 The Declaration of Paris in 1856 and other treaties have outlawed letters of marque and reprisal. 7 Modified by the District of Columbia Home Rule Act of 1973. 8 Changed by the Sixteenth Amendment which permits a Federal income tax, and the Twenty-fourth Amendment, which prohibits Federal pollution. 9 Modified by the Twelfth and Twenty-third Amendments. 10 Clarified by the Presidential Succession Act of 1947 and by the Twenty-fifth Amendment. The President shall have Power to fill up all Vacancies that may happen during the Recess of the Senate, by granting Commissions which shall expire at the End of their next Session.Section 3. He shall from time to time give to the Congress Information of the State of the Union, and recommend to their Consideration such Measures as he shall judge necessary and expedient; he may, on extraordinary Occasions, convene both Houses, or either of them, and in Case of Disagreement between them, with Respect to the Time of Adjournment, he may adjourn them to such Time as he shall think proper; he shall receive Ambassadors and other public Ministers; he shall take Care that the Laws be faithfully executed, and shall Commission all the Officers of the United States. Section 2. The judicial Power shall extend to all Cases, in Law and Equity, arising under this Constitution, the Laws of the United States, and Treaties made, or which shall be made, under their Authority;—to all Cases affecting Ambassadors, other public Ministers and Consuls;—to all Cases of admiralty and maritime Jurisdiction;—to Controversies to which the United States shall be a Party;—to Controversies between two or more States; between a State and Citizens of another State;11—between Citizens of different States;—between Citizens of the same State claiming Lands under Grants of different States, and between a State, or the Citizens thereof, and foreign States, Citizens or Subjects. 11 Changed by the Eleventh Amendment. 12 Made obsolete by the Thirteenth Amendment. Section 3. New States may be admitted by the Congress into this Union; but no new State shall be formed or erected within the Jurisdiction of any other State; nor any State be formed by the Junction of two or more States, or Parts of States, without the Consent of the Legislatures of the States concerned as well as of the Congress.The Congress shall have Power to dispose of and make all needful Rules and Regulations respecting the Territory or other Property belonging to the United States; and nothing in this Constitution shall be so construed as to Prejudice any Claims of the United States, or of any particular State. Section 4. The United States shall guarantee to every State in this Union a Republican Form of Government, and shall protect each of them against Invasion; and on Application of the Legislature, or of the Executive (when Legislature cannot be convened) against domestic Violence. Section 3. This article shall be inoperative unless it shall have been ratified as an amendment to the Constitution by the legislatures of the several States as provided in the Constitution, within seven years from the date of the submission hereof to the States by the Congress. Section 1. In case of the removal of the President from office or of his death or resignation, the Vice President shall become President.Section 2. Whenever there is a vacancy in the office of the Vice President, the President shall nominate a Vice President who shall take office upon confirmation by a majority vote of both Houses of Congress.